TengizChevroil (TCO) is a multibillion dollar 40 year long project that started in 1993 as a result of an agreement between the then-two year-old Kazakhstani government and the Chevron executives. The contracts between Chevron and Kazakhstan are not publicly available and that creates complications in accessing data about plans, payments, royalties, and any other crucial information . Ever since the project’s conception, numerous ecological, health and labour-related problems have persisted. To start with the pollution of atmosphere, from 30 atmosphere control stations built in 1988, only 14 are left since TCO’s take-over of the exploration of Tengiz . To date TCO has paid the fines of more than 7$ million based on the post-factum data collected from TCO’s computers, especially for storing excessive amounts of sulfur (a byproduct of crude oil production) in 2006  and then in 2009, and for flaring excessive amounts of gas during the entire year of 2010 . Gas flaring is illegal in the country, and TCO has been simply paying fines without changing its practices in this respect. However, according to the director of the Science Centre for Ecological Problems of Atirau Region of the Atirau Oil and Gas Institute, Dr. Muftah Diarov, since 2002 all the fines have been fed into the federal government, where no one in the region benefits from them. He has made numerous appeals to the government to create locally based funds, but has been met with rejection . Another significant factor is the deteriorating health of local residents, TCO workers, and conflicts in the workplace. According to NGO ‘Kaspiy Tabigati’ Director Makhambet Khakimov, in the 90’s 64 workers were reported to have died on the workplace, and after 2000 the data and statistics were not publicly accessible anymore . Starting in 2001, multiple labour conflicts have been reported. With the peak occurring in 2006, when a massive fight occurred between Kazakhs and Turks working on TCO, with 339 Turkish citizens injured. The reasons, as for many other earlier and later conflicts, have been named as wage discrimination against Kazakhs, disrespect by Turkish workers, unlawful firings and work conditions . As for the health of local residents, in the early 2000’s the-then governor of Atirau Oblast’ I. Tasmagambetov ordered a medical examination of people of three villages located in the immediate proximity to the oilfield: citizens of all ages were found to be in poor health 1,2-2,0 times more than in the control region, women’s reproductive abilities were compromised, and the number of children born with abnormalities was 4,3 times higher than in the control region . In 2004, TCO was forced to pay 76$ million to relocate the village of Sarykamys, since the area was recognized as unlivable . NGO Crude Accountability claims to have followed up on the relocation and have found that many villagers did not get their promises met . At present, TCO is moving forward on the expansion to build a new III generation plant and a sea channel to transfer cargo and oil to the Aktau seaport and back . Dr. Diarov in addition to his 'scientific activism' has published a detailed report that specifies that if the seaport is built, tremendous destruction will be caused to the ecosystem of the region that is already suffering from massive pollution (4,360g of emissions for each tonne extracted, where the norm is no higher that 2200g) . At the publicly held consultation, NGO activists and Dr. M. Diarov have expressed their full discontent and disapproval, voicing their grave concerns for the environment, stating corruption in employment of unqualified people for TCO jobs, and expressing desperation with local government's compliance with the will of TCO executives . 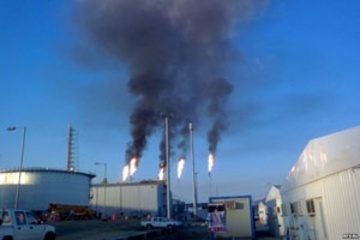 In April 2015, due to the fact that compressors on the torch 0130 stopped working there was an illegal burning of sour gas (natural gas containing significant amounts of hydrogen sulfide) that polluted the surrounding environment. In December 2015, the Special Interregional Economic Court of Atirau Oblast ordered TCO pay the sum of 124 614 855 KZT (approx. 342 000 USD with conversion rate of 1 USD=365 KZT) to the Kazakhstan government for the damages done to the environment, effective immediately . In addition, in April 2015 this Kazakhstan’s leading oil producer slowed its previously announced expansion plans in response to lower oil prices. Originally, the expansion had been planned to be over by 2019. Now with the weak price of oil, the plan might be delayed by two or more years . That represents a slight gain for environmentalists, who had expressed grave concerns about the expansion of the project. . In October 2015, the last ton of open-air stored sulfur was sent for treatment at the nearby processing facility. Tim Miller, general director of the company, stated that from now on TCO would only produce the amounts of sulfur it can send to consumer. However, environmentalists do not share the optimism of the company. According to M. Diarov due to the fact that sulfur was stored in the open air for years, the wind blew out thousands of tons of the element and it gradually got soaked up by the soil. As a result, all soil within a 70km radius is barren. .
Project Details One of the world's deepest onshore reservoirs: 4,000-6,000m deep into the ground. Reported deposits: 26 billion crude oil barrels, of which recoverable: 23%-35%. Extremely high concentration of sulfur (around 17%). In 2013, 581 thousand crude oil bbl/day were extracted. With further development, 800 thousand crude oil bbl/day extraction is expected. In the same year, 251 billion cubic feet of natural gas were extracted. Scientific community, headed by PhD Muftah Diarov. - Implement complex multi-level ecological studies of the area to assess TCO's impact on the entire region, not just the assigned zone with the radius of 10km. -Limit and reduce the amount of oil drilled at Tengiz. Current levels of 24 million tons/yr are a strain on the environment. With planned expansion to 36 million tons/yr the situation will get even worse. Why? Explain briefly. Partially, it has been served. Since newer technology has been implemented and the level of pollution per each ton extracted have been reduced. In addition, infrastructure and education initiatives have been followed thru in Aktau and Kulsari. However, citizens keep experiencing symptoms of poor health, fine payments do not even reach the regional government, and poisonous effects on the environment remain not assessed. The issue is complicated by unwillingness on the part of TCO to make information public related to their financial contracts and labour relations. Further, TCO promises that their expansion will not affect the environment, relying on the findings of their contractor ecological firms. However, public greatly distrusts such findings and citizens keep calling for unbiased and impartial examination of the area. In general, citizens do not trust the goodwill of the company, stating that the government and TCO do not wish to address pressing issues of environmental and health degradation, but only focus on economic and strategic benefits.